For the month of June Oak Leaf Studio is hosting a retrospective of the work of Ashland artist Leif Trygg. In a nod to the past, the show features drawings, paintings and mixed media created since 1966 until today. 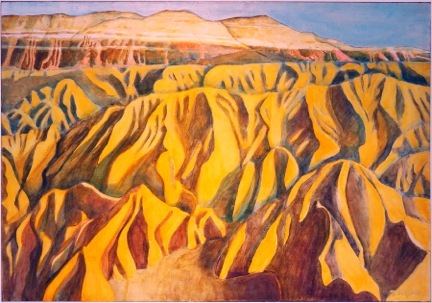 Known for his landscapes of Ashland and Southern Oregon, Leif Trygg began his career as a graphic artist in the San Francisco Bay Area. He started and ran an advertising design firm that thrived helping high tech startups in the Silicon Valley area. He later worked as a graphic designer and illustrator for several technology companies as well as retailers. Since moving to Ashland in 2006, Leif has focused on creating his own fine art. In 2014 he opened Oak Leaf Studio as a place to produce art as well as showcase it. In a nod to the future, on First Friday, June 2, from 5pm to 8pm, Oak Leaf Studio is proud to host Nan’s Raw Goods, our partner during A Taste of Ashland. Nan produces raw, vegan, gluten-free food that is incredibly flavorful. Our personal favorites are the White Chocolate Vanilla Bean Truffles and the Orange Ginger Glazed Donut Holies. Other popular flavors include Raspberry Pepperonis, Oh Snap! Ginger Balls! and Lime & Coconut Macaroonies. To learn more, go to nansrawgoods.com. Oak Leaf Studio is open Tuesday thru Saturday from 11am to 3pm. The Studio is located behind the 1908 garage at the end of a long brick driveway at 247 Oak Street, between the Hanson Howard gallery and Ashland Art Works.